This week's Way Back Wednesday doesn't take us back too far. However, it does feature not only an extinct character greeting, but also an extinct land. Since today is our son's 8th birthday, I thought it would be fun to feature a "way back" shot of him at age 1. 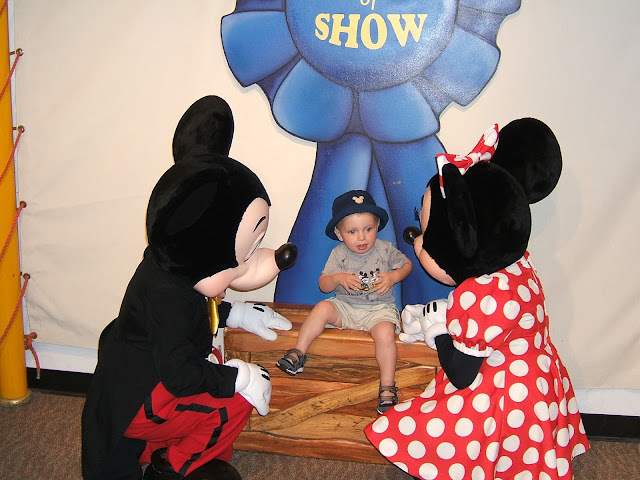 He is having what appears to be an interesting discussion with Mickey and Minnie in the old Toontown Fair section of the park. This land was turned into Storybook Circus in 2012, and Mickey was moved to Main Street, USA.